Professionally designed brochures for your company will help you to increase sales and strengthen your company’s identity. DLM Marketing’s approach to designing brochures usually involves an initial discussion to find out what the purpose of the brochure is and any other details that we need to know to design your brochure. Once we have all the details from you we will draft up a design brief for you to review and sign off on. 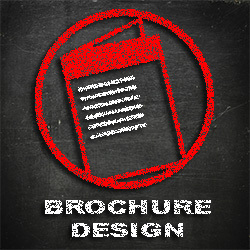 Once the design brief has been finalised we can have your print ready design to you normally within a few working days. Additionally we will supply you with a web optimised copy of your brochure that you could upload to your website or send to customers via email. Please contact us with your requirements so we can provide you with a detailed competitive quote. If you’ve ever received a quote from a graphic design company, and sat looking at the screen, a low whistle escaping you, wondering incredulously how people afford to market their businesses. you have probably also considered just doing your own design! The most common corporate printed material (after business cards) is the company brochure – it’s a necessity for many businesses. Besides the knowledge of what your company does, there are quite a few skills needed for brochure design. The end product may look great but it is highly possible that your end DIY product won’t. Any company brochure should strengthen your company’s brand. Even more than your business card (which will be used mainly in B2B situations), a printed brochure is often the main physical point of contact for your customers when they are considering your products or services. It is vital that it be professional, attractive, and say everything that you need it to in a compelling way.